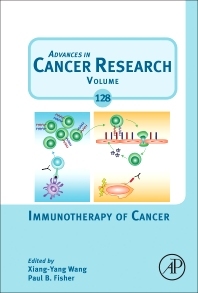 Immunotherapy of Cancer provides information on cancer research related to inflammation and immunity, containing outstanding reviews by experts in the field. It is suitable for researchers and students who have an interest in cancer immunobiology. Researchers and students in the basic and clinical sciences of cancer biology and oncology, plus related areas in immunology, genetics, pharmacology, cell biology, and molecular biology. Professor, Dept of Human & Molecular Genetics, Virginia Commonwealth University, USA; Associate Director, VCU Institute of Molecular Medicine, Virginia, USA. The Wang laboratory has a long-standing interest in understanding stress response and stress sensing molecules in regulation of inflammation, host immunity, and the pathogenesis of diseases, including cancer.